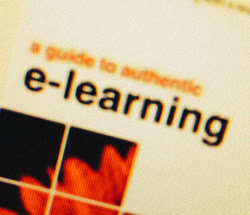 The library at my school has a book entitled A Guide to Authentic e-Learning by Jan Herrington. Unfortunately, it is currently signed out. However, Jan had a brilliant idea! She made a series of short videos that describe each of the steps in her authentic learning model: Authentic context, Authentic task, Expert perspectives, Collaboration, Articulation, Reflection, Coaching & Scaffolding and Authentic assessment. The videos are all accessible from the website devoted to the book so even without access to the book at this moment, in about 30 minutes time, I have gleaned a reasonable amount of comprehension about her process. The website contains more than just videos. One very interesting item is a link to a shared Diigo group on Authentic Learning where people can share resources on the topic together using social bookmarking. Great idea. Another very useful document on Jan’s website is an evaluation matrix so that you can evaluate your course activities in the continuum from non-authentic to authentic. I like it a lot. Do you have experience conducting authentic tasks in e-Learning contexts? If so, tell us about them in a comment below. What are your favourite tips, tricks and strategies? Here is a planning worksheet we used to create authentic learning activities based on our requirements for course objectives and outcomes. That's a great worksheet Greg. Thanks for sharing it. Thanks for the ideas and worksheet. Very thought-provoking ideas. What training or learning initiative couldn't be a little more authentic?